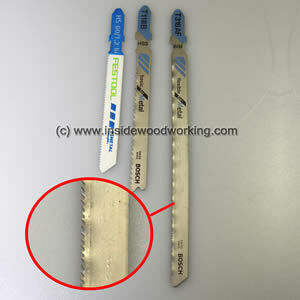 This is part 2 of our jigsaw blades for woodworkers review. What makes the jigsaw such a versatile power tool is its ability to cut through a variety of materials such as wood, metal, or ceramics. In the following we cover the most common non-wood cutting Bosch jigsaw blades. 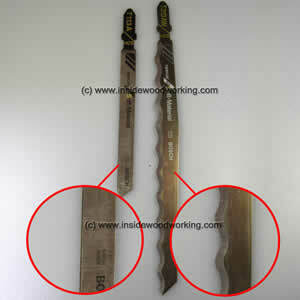 Metal-cutting jigsaw blades commonly have a wave type side-set of the teeth. They’re available in different lengths for cutting different and longer depths. Besides jigsaw wood cutting blades where each tooth is side-set. On jigsaw blades for metal, the teeth are side-set in groups and in a fluent shape. This will prevent the blade from being squeezed too much in particularly when cutting soft metals such as aluminum. (seen next Image shows the Bosch jigsaw blades numbers T118B and T318AF, and Festool jigsaw blade number HS 60/1.2). In the daily life of a woodworker, a jigsaw blade that cuts soft material isn't what you first think of when thinking about the best jigsaw you got in your workshop. However, when your jigsaw blade for soft material including insulation and polystyrene you'll appreciate how useful this type of jigsaw blade can be. This group of blades is often used in typical home improvement jobs such as frame working. This kind of blade aught to be considered when soft material such as insulation is to be worked. In reciprocating saws, their larger blades are often used for cutting 8 to 10 inches of insulation material at one time. 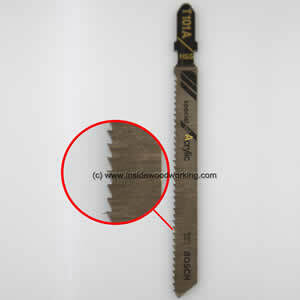 The standard jigsaw blade is one of the most universally underestimated blades. 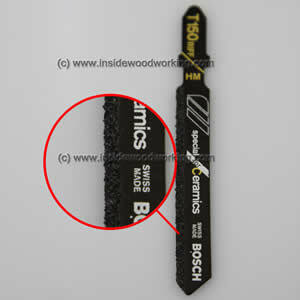 (seen next Image shows the Bosch jigsaw blades numbers T113A and T313AW). Other than for insulation cuts, this type of blade is often used to cut a variety of materials such as rubber, leather, carpet, or cardboard. This kind of special jigsaw blade cuts ceramics and cement board among other materials. This blade is used to commonly cut fiberglass and reinforced plastics. This process sees the professional woodworker-cutting fiberglass often used in construction type work. Important! This blade has a tungsten carbide edge and no teeth. The tungsten carbide edge cuts more like a file and not a saw. During this action the pendulum or orbital action on the jigsaw should be switched off. You should also turn down the speed of your jigsaw so that the TC blade won’t over heat. It can overheat when cutting tiles. (seen next Image shows the Bosch jigsaw blade T150Riff). When cutting fiberglass with a jigsaw you can, do this with a ‘grit type blade’ that cuts like a file. A ceramics blade is common. Your alternative is to use a special tungsten carbide tipped (TCT) jigsaw blade with teeth. Rather than "grinding" the cut, this type if blade really cuts. Alternately, the tungsten carbide tipped blade guarantees extended life and provides a cleaner and faster cut in all sorts of reinforced plastics or epoxy. You can use it on fiber cement boards and is a very commonly used blade for contractors, carpenters and roofers (seen next Image shows the Bosch jigsaw blade number T341HM). Cutting acrylic material is perhaps one of the trickiest tasks in the workshop. Most of the time, the material being cut tends to overheat and will "smear" when cut. Special jigsaw blades for acrylic materials solve the problem. This blade looks at first, like a standard jigsaw blade for wood. Closer examination shows that the teeth are not side-set, but are taper ground. When the blade is used on acrylic such as ‘perspex’ or polycarbonate, make sure you reduce the speed on your jigsaw and keep the orbital action at a low rate (seen next Image shows the Bosch jigsaw blade number T101A). So many more blades are available from a variety of manufacturers. This article showed you just the most important jigsaw blades used by woodworkers, contractors, carpenters and roofers in today's market. Hopefully giving you a better understanding of which blade can be used for which application. This has been the final part of our jigsaw blade review series. Focusing mainly on Bosch jigsaw blades for non-wood materials.